Karina's Kreations: Stampin'Up Happy Celebrations Sneak Peak! 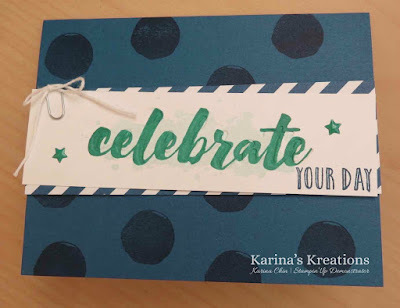 Stampin'Up Happy Celebrations Sneak Peak! There are new celebrations duo textured impressions embossing folders #142760 coming out Jan 4. One folder says, "happy" and the other folder says, "celebrate". These folders are designed to coordinate with the Happy Celebrations stamp set #143012. I have been having fun playing with them. I cased a card from the Stampin' Success magazine. You get this fun magazine with your demo number. The starter kit will be on special starting Jan 4. It's a great time to pick up your kit and I would love for you to join my team. If you have any questions email me at kchin2@telus.net. The card stock colors are Dapper Denim, Emerald Envy and Whisper White. I used the In-color 2016-2018 Designer Series Paper Stack#141408 and 2016-2018 In Color Enamel Shapes #141410 on my card. The paper clip #142766 holding the Whisper White baker's twine #124262 is new.